Here’s a success story about the power of viral marketing–spreading the word about a new product through modern electronic means, such as the Internet, e-mail, social networks, blogs, text messaging, etc. 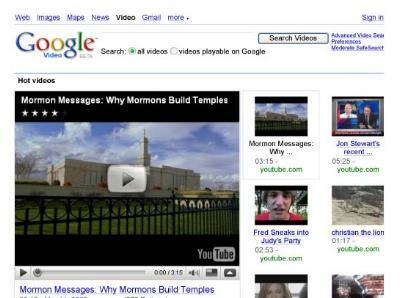 If you’re a reader of LDSMediaTalk, you know that on Thursday, March 12, the Church posted a video on the Church’s YouTube channel Mormon Messages titled “Why Mormons Build Temples.” We also posted it on the home page of LDS.org, on a page in Mormon.org, and put links to it on the Newsroom commentary “The Publicity Dilemma. Over the weekend, BYU-TV played the video between some programs. We also advised people about the video via LDS Gems (100,000 subscribers), the Church’s Facebook page (70,000 fans), and spread the word among LDS bloggers. This viral campaign cost the Church nothing but a few hours of time. What happened over the next 96 hours was nothing short of a miracle. 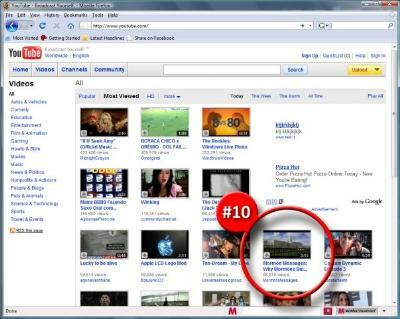 On Friday, March 13, the video became the #10 Most-Watched Video on YouTube. 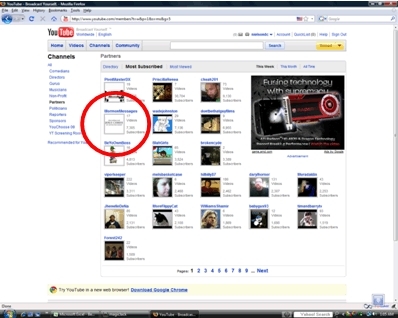 This caused the video to be featured on the main YouTube home page (which provided more exposure). On Saturday night, March 14, the Google Videos search page ranked the video as the number one “Hot Video”, highlighting it prominently on the Google Videos search page. On Sunday, March 15, MormonMessages was identified as the #4 most-subscribed channel (for the current week) on YouTube. Many visitors not only watched the video, but also subscribed to the channel itself so they can receive e-mail alerts on future video offerings from the Church (now over 8,000 subscribers). Sunday morning, the comments being made on the video shifted from almost exclusively being made by members to being made primarily by non-members. Although many of the comments were negative, this is evidence that the visibility and popularity of the video did cause many non-members to view it—even if, in the end, they didn’t agree with its message. By Monday, March 16, the video had received nearly 200,000 views on the MormonMessages YouTube channel in just 96 hours. The channel itself had received nearly 300,000 visits. It is clear that many of the visitors also viewed other Church videos on the channel because their viewing numbers were up substantially. This confirms to me that the membership of the Church is ready and willing to help the Church spread such messages. Tell your friends they can stay up-to-date about Church initiatives like this by subscribing to this blog, LDS Gems, News Around the Church, Newsroom, the Church YouTube channel, and the Church’s Facebook page. Tremendous job. I hope this sets a pattern for what we will see more of in the future. This video is a cut-down version of “Between Heaven and Earth,” a ~ 45-minute exploration and exposition on Temple available from Church Distribution. Way to go, I guess even bad exposure can turn positive! Tell Greg congrats!! I should mention that many cult watch groups are waging a youtube campaign where they search for Mormon videos to rate poorly and “battle” against. Thus I think many more non members liked it than the comments indicate, simply due to the fact that only a few active anti mormon groups can contribute a great deal of negative comments. And if it was prominently displayed that only increased their efforts. Nice work Larry and team! Thanks for sharing the details. Lots to apply to much of what we do. What an awesome success story.. we can be heard if we just do it smarter! Thanks for sharing.